A quick look ahead at what a couple of national government forecast agencies are showing for Christmas Eve and the Post-Christmas Storm I mentioned in my previous blog post. First Sunday night through Christmas Eve. There is potential for parts of Missouri to central Indiana will encounter some light moisture being spread up from the south. The moisture will encounter cold air near the surface. Whenever you mix warm air a few thousand feet up and cold air at the surface you can get freezing rain. This may be the case Sunday - Monday. The Hydrometeorological Prediction Center has put out their probability forecast for freezing rain that covers 6pm CT Sunday through 6pm CT Monday. 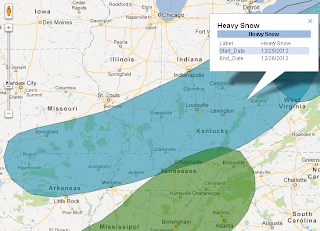 HPC indicates a heightened probability of freezing rain from roughly St. Louis to Indianapolis along and north of I-70. Not great for travelers during that time period along a major interstate. The one bit of "good" news is that it should be light. Generally less than 0.10". However, it doesn't take much to make driving "interesting". This isn't set in stone so if you plan on traveling be sure to check the latest forecast. Also want to show you what the Climate Prediction Center has highlighted in the Day 3-7 U.S. Hazardous Weather Outlook. They are highlighting an area of "heavy snow" December 25 through December 26. So it looks like they are on board with the Post-Christmas Snow Storm. Although, this is subject to change and likely will wiggle around as computer models crunch the numbers.